If you have a chance to visit Vietnam someday, rau muong (water spinach/water morning glory) is a must to try. I said it’s a real “must” here as rau muong is very popular in every day meal, especially in tourism sites. It’s an easy-to-eat vegie in Vietnam and how it’s made is so diversified that you will never feel regretful trying it. Rau muong, botanically classified as Ipomoea aquatica, is a semi-aquatic pantropical herbaceous vine grown for its leaves, which are harvested both young and mature. However, its young shoots and leaves are preferred to mature leaves as they are texturally more tender and sweeter in taste. Rau muong is a member of the morning glory family and shares the same genus as the sweet potato. In much of southeastern Asia, rau muong is considered a tonic as certain species contains several vitamins, including A, B, C, E, and “U” (S-methyl-methionine). It is used to treat stomach and intestinal disorders. During the wartime, when Vietnamese people had to live in very poor conditions, rau muong was favorite dish of any Vietnamese soldiers served with sour and crispy flavor of eggplants (my father – used to be a soldier – imagined and renamed it elephant’s meat during those hard days without protein). For northern soldiers, these poetry lines were especially known by heart: “Anh đi anh nhớ quê nhà – Nhớ canh rau muống, nhớ cà dầm tương”. They mean, “Missing my hometown, missing water morning glory soup and missing eggplant soaked in soya bean”. When I was a student, water spinach was part of my daily meal as the vegetable is inexpensive and can be cooked in many different delicious ways. 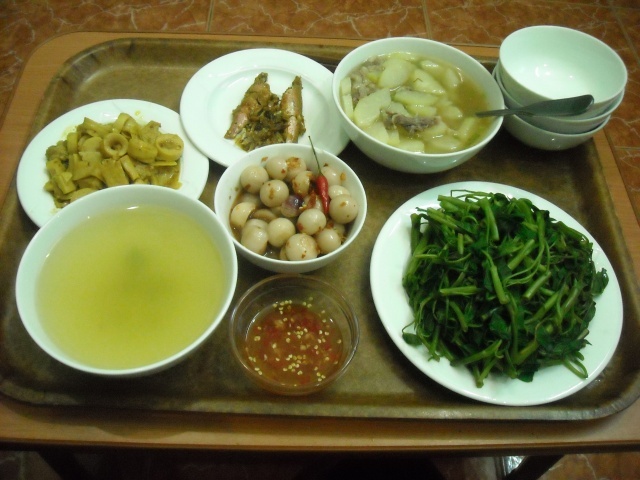 My mom cooked it every day in summer time (‘cause summer is rau muong’s season). 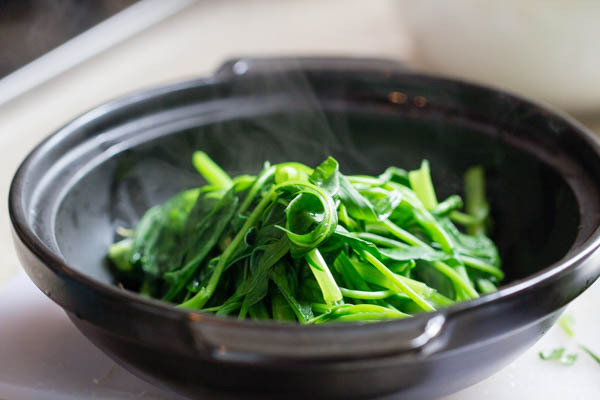 The most popular way to cook water spinach is to boil it. We usually boil the vegetable then strain it. The water morning glory is served by dipping it into a delicious fish sauce flavored with chilly and garlic cut into small pieces with drops of lemon. Its broth, which is often added with salt and lime juice or boilt dracontomelon, is a little bit sour, delicate and very cool for summer day. 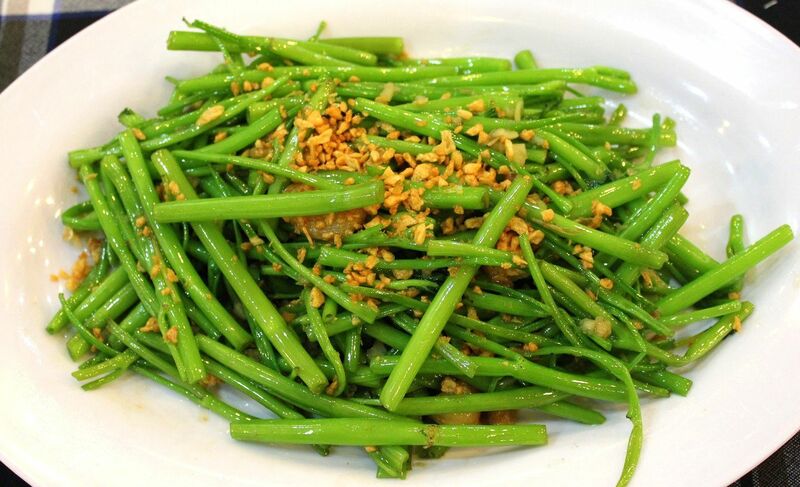 Another form of rau muong in daily meal, which you most see in your table in tourism sites is rau muong stir-fried with garlic. Nowadays, fresh water morning glory can be found in Vietnamese markets in the USA. For those who want to take a stab at making this dish at home, it's very easy and inexpensive. Directions: 1. Select the younger one and remove the mature. Wash water spinach thoroughly, rinsing at least twice to remove any remnants of dirt or sediment. 2. In a large pan, heat oil and add minced garlic, stir-frying over medium-high heat to release the aromatics. Stir well with salt and pepper. Cook for 1-2 minutes with high heat to retain green color and crispy level of the vegie 3. Plate, then garnish with fried garlic. P/S: If you desire some vegetable broth, you may boil rau muong for several seconds before stir-frying it. 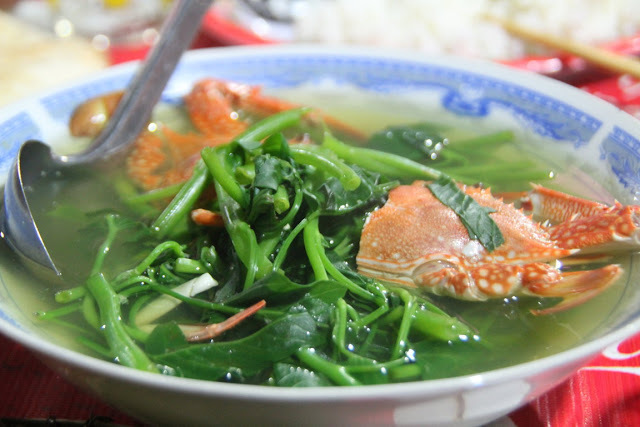 Because of its intense popularity, rau muong is also well-known with its soup recipe for summer time. 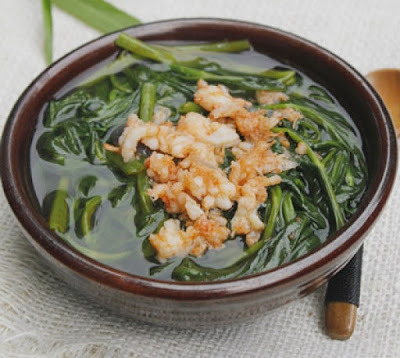 Vietnamese water morning glory soup with fried garlic, dry shrimp, tomatoes and mushroom and fish sauce can be cooling and appetizing on a scorching summer day. The soup is best served with some rice. 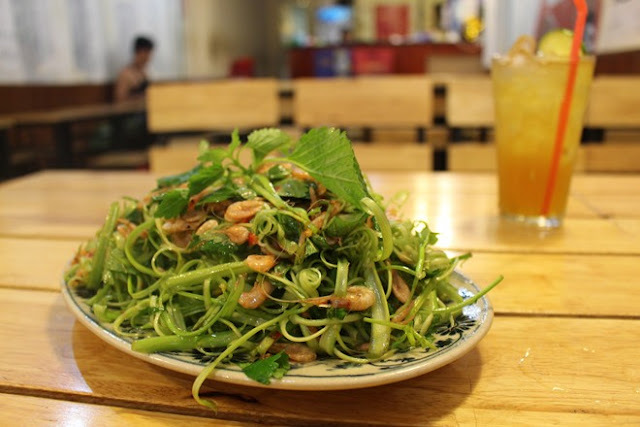 Final in this list but shining in Vietnamese cuisine is Nom rau muong (Water spinach salad). 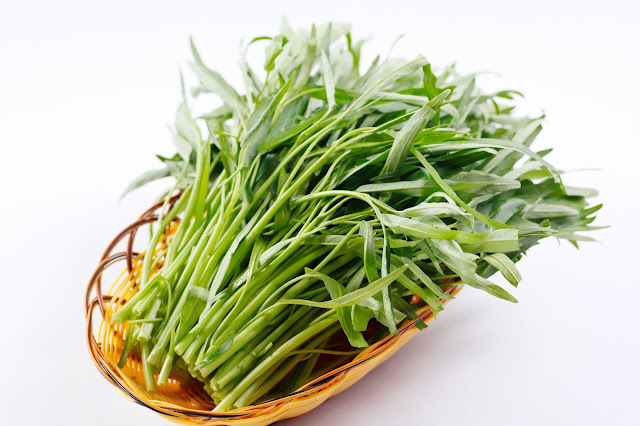 This popular dish from central Vietnam is a great example of local ingenuity, making use of the entire plant, and also finding a delicious way for preparing the stems, which otherwise would be quite tough. First, you remove the bottom half of the water spinach stems for use in this salad. Using a sharp knife, cut the stems into thin strips and place in iced water, to make them curl. Leave to soak for 30 minutes. For the dressing, whisk together the sugar and lime juice until the sugar has completely dissolved. Stir in the fish sauce. Then, drain the water spinach stems. Separate the stems to make for easy serving, then place in a large bowl. Add the spring onion, herbs, chilli, fried garlic, fried shallots, sesame seeds and peanuts. Pour the dressing over the salad and gently toss to combine. Serve on a large platter, sprinkled with the extra sesame seeds and peanuts. Water spinach is one of Vietnamese outstanding traditional dishes that remains its popularity until today however with elevating flavors. This can be explained by its origin associated with a very hard but magnanimous period of time of our nations and people. Rau muong naturally grows up and feeds thousands of Vietnamese national heros.